The USB Flash drives have always been impressive. On top of that, the USB Type C offers blazing fast speeds, and you have a great looking USB Flash drive that will provide you access to endless portable storage on the go. Let us check out the best USB Type C OTG flash drives that redefine your file storage requirements. USB flash drives tend to be affordable and lightweight. They also offer you a high degree of portability. Moving your files across computers and other devices is made easy, thanks to the USB flash drives. Add to it the functionality provided by USB Type C ports. This new reversible interface connection has made it possible to connect them with your smartphones as well. You are no longer limited to using your USB flash drives with computers alone. This is made possible with the help of the technology called OTG, or On The Go. USB OTG refers to the communication standard where a USB peripheral can be connected with the mobile devices that include smartphones and tablets. Most of the devices currently available are compatible with the OTG functionality and detect most of the USB flash drives when attached to it. With the USB Type C on the way to becoming a standard option on most of the devices, it may be a great idea to invest in USB Type C OTG flash drives. 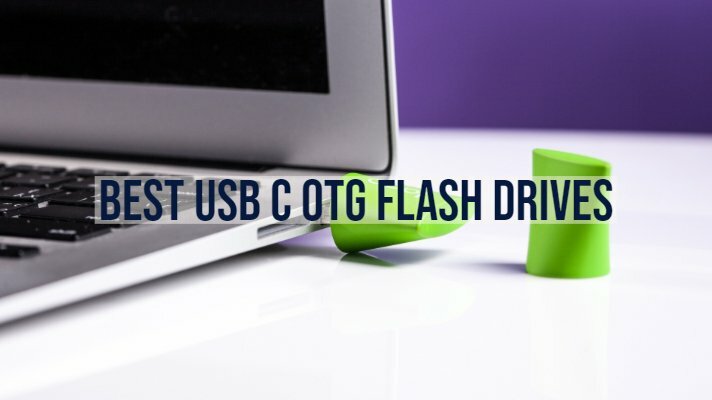 Having understood the importance and the key advantages of using a USB Type C OTG Flash drive, let us explore a few top end OTG flash drives with the USB Type C functionality. Samsung Duo Plus 128GB is a great option for stylish functionality. The flash drive is available in multiple options – right from 32 GB to 256 GB storage options. It is one of the best options for dual functionality. You can either use it as a USB Type C flash drive or use it with the Type A adapter. The flash drive is fast and flexible with the complete dual functionality. The flash drive comes with a USB 3.1 read speeds that range up to 300 MB per second. The USB Type C OTG flash drive is also backward compatible with USB 3.0 and USB 2.0 standards. The drive comes with a waterproof, dustproof, shockproof and temperature proof properties and one of the best for any usage conditions. 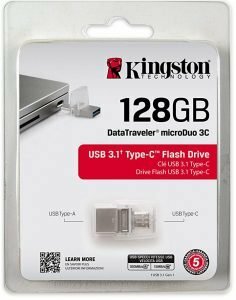 Versatility is what makes Kingston Digital 128GB one of the best options if you are looking for a flash drive with USB Type C OTG compatible flash drive. The drive is consistent with both USB Type C found on newer smartphones and tablets and older USB Type A devices. The flash drive can be an excellent option to improve the storage capacity of your smartphones and tablets. Moreover, it will also help use the same set of files on both your computer and smartphones. What makes it a great choice? The dual interface for both USB Type A and USB Type C will make it an excellent option for use with any device irrespective of the connector type offered on the devices. The USB 3.1 performance standards will provide you access to speeds of up to 100 MB per second read and 15 MB per second write speeds. What’s more – the flash drive comes with a five years warranty. The flash drive comes with an elegant design. The connectors are protected when not in use. This will ensure that it would not suffer any bending or other damage accidentally or through human errors. The flash drive comes with five different storage configurations. You can buy the flash drives in 16, 32, 64, 128 and 256 GB storage options. The drive comes with dual connector options for both USB Type C and traditional USB Type A connectivity options alike. The drive comes with compatibility with the SanDisk Memory Zone app as well. It has access to the high-speed USB 3.1 standard of performance. You get the read speed performance up to 150 MB per second. It is also backward(s) compatible with USB 3.0 and USB 2.0 standards. The Sony 64GB USB Flash Drive comes with a downloadable file management software for enhanced performance. The drive is compatible with Windows10, 8.1, 8.7 and Mac OS X 10.8 or later. In the case of smartphones, the compatibility begins with Android 4.1. As has been standard practice, the flash drive offers you dual compatibility that supports both USB Type C and traditional USB Type A. It can perform as an excellent content bridge between your smartphones and computers. The flash drive is available in three different options that include 16, 32 and 64 GB. The lack of 128 GB or higher options may not be a good idea. Transfer speeds are comfortable with 130 MB per second at the maximum. The PNY Duo Link is an excellent option if you are looking for an affordable option for USB 3.1 speeds on a USB Type C connectivity option. You can get speeds of up to 130 MB per second. The connectors are protected with a sliding mechanism for protection against damage when it is not in use. The PNY flash drives are available in multiple storage options that include 32, 64 and 128 GB. The textured look of the flash drive will provide you access to a premium look for the flash drive. The grip is good enough and assists you a better ergonomic comfort when using the flash drive. 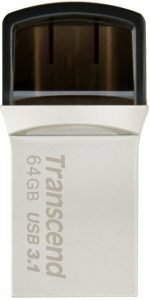 The Transcend 64GB JetFlash 890S flash drive once again comes with a dual connectivity option. One end of the drive comes with a USB Type A connectivity, while the other side has a USB Type C connectors. You can be assured of speeds of 90 MB per second read and 30 MB per second write speeds. You can even secure the documents you save with the 256-bit encryption functionality. The flash drive comes equipped with a Transcend Elite software for enhanced file management and security features. Those were a few good options you can go with if you are looking for the best experience in terms of file transfers and extra storage options for your smartphones and tablets. The USB Type C is on the way to become the mainstream standard interface for the smartphones, and the flash drives we have featured here should assist you in every possible manner to make use of the enhanced features offered by the USB Type C flash drives. Do share your comments and suggestions in the comment box below. We are happy to help. Thanks for visiting us!